Is Pope Francis right about traditionalists who love the Latin Mass? As part of their efforts to draw us into a deeper faith life, my parents brought me and my brothers to a Tridentine Mass when we were kids. I do not recall being particularly impressed the first few times. One summer Sunday, however, I decided to attend one on my own, mostly for a change of pace from my home parish. This particular Sunday turned out to be the Feast of Corpus Christi, and I was caught off guard by the sheer spectacle of the ritual. I briefly resented that the hymns and processions would keep me in church longer than I had originally planned, but I was soon overwhelmed by a feeling that I can best describe as communion. This was, I mused, the Mass as it was experienced by so many saints throughout history. Although there was no one in the pews around me, I began to feel as though I was surrounded by the saints who had come to know and worship God through this liturgy. I did not at that point understand that the rituals of the Mass had changed numerous times over the two millennia of Christian history, but learning about these changes never made me doubt the core of my experience that day. I always try to understand what’s behind the people who are too young to have lived the pre-conciliar liturgy but who want it. Sometimes I’ve found myself in front of people who are too strict, who have a rigid attitude. And I wonder: How come such a rigidity? Dig, dig, this rigidity always hides something: insecurity, sometimes even more.... Rigidity is defensive. True love is not rigid. I have been pondering this statement since I first read it. I wondered whether I was the sort of person he had in mind. Was I a “rigid” Catholic? The experience of being surrounded by the saints at the Latin Mass was one of the most profound and formative spiritual experiences of my teenage years. The experience of being surrounded by the saints at the Latin Mass was one of the most profound spiritual experiences of my teenage years. My experience with the Latin Mass offers one possible answer to Pope Francis’ questions about why young people are attracted to traditional liturgies: Having grown up with the Mass in English, these young Catholics have a vague sense of what any given moment in the Mass is about. The unfamiliar rituals and language of the Tridentine Rite, however, allows them to see these moments with fresh eyes. Discovering the Latin Mass is, to many members of my generation, what the introduction of the vernacular Mass was to people like Francis. Love of God and neighbor runs at least as deeply in them as it does in me, even if that love manifests sometimes in Latin prayers. As for the “strict” and “rigid” people about whose insecurities Pope Francis frets, he is clearly not referring to everyone who wants the option of attending the pre-conciliar liturgy. Although some of my friends will wrinkle their noses at certain kinds of homilies or deviations from the liturgical rubrics, their tastes are hardly worthy of a psychiatrist’s couch. They do not need anyone to “dig” into their psyches. Love of God and neighbor runs at least as deeply in them as it does in me, even if that love manifests sometimes in Latin prayers. To whom, then, is Pope Francis referring? The answer may lie in Francis’ own past. As the Jesuit provincial and later the rector of the Jesuit seminary in Argentina, Jorge Bergoglio was known as a strict and formidable figure, and he had a sizeable following among the members of his province. But his critiques of traditionalist Catholic groups are seldom read through that lens. When the pope suggests that strictness and rigidity conceal insecurity, he may be speaking about people he once knew quite well or even about himself. Francis’ former inflexibility ought to give much more credibility to his warnings about the pitfalls of modern traditionalism. Traditionalists do not take his criticisms as seriously as they probably ought to. But without any additional context, Pope Francis’ statements sound less like pastoral advice and more like the perennial lamentation of older generations about trends among the young. The same can be said about many of the admonitions I have heard from the Vatican II generation about the flaws of the pre-conciliar church. It was not until I had extended conversations with these Catholics that the depth and relevance of their experience became clear. If I had not taken the time to listen and ask questions, all I would have heard was a clichéd lament about young Catholics trying to turn the clock back to the 1950s. But when I did listen to my elders, I learned about many ways in which too sharp a focus on enforcing and following rules risks leading people into spiritually empty legalism and superstition. I learned about groups of men who would stand outside the church smoking until the offertory, since that was the crucial point to fulfill one’s Sunday obligation. I discovered that many priests who outwardly seemed firm in their vocations, after the council nonetheless abandoned the priesthood. Criticisms by older Catholics of neo-traditionalist practices and tendencies are not an allergic reaction to the smell of incense. They are caution that stems from experience. Many young Catholics seek a greater understanding of and continuity with the pre-conciliar church. Many older Catholics who lived through the council and are intimately familiar with the flaws of the pre-conciliar church worry that revisiting old-fashioned practices will bring back problems that Vatican II took pains to correct. Each group has something to learn from the other. Those lessons only become clear when we set aside ideological concerns and have the patience to understand each other’s experiences. The form of rigidity we most need to worry about is the ideological rigidity that prevents us from seeing how God is at work among our fellow Catholics. We find commonalities when we have the patience to look for them, just as the liturgies we attend look quite different but are at heart the same celebration of the Paschal mystery. "I began to feel as though I was surrounded by the saints who had come to know and worship God through this liturgy. " Isn't that an awesome feeling? Along with Gregorian chant with roots from the papacy of Gregory the Great, to the use of Latin with roots to even way before that, the traditional Latin Mass is perhaps the greatest way to connect to the many, many saints who lived before the 1960s. There is nothing rigid about that. If there is, then perhaps it's a good thing. As a child I went to Latin mass. I wanted to understand for my First Confession and First Communion and Confirmation. No deal. In grade 9 in a Catholic high school we were "feed" translations. How joyful was I when English became the norm, albeit old English. As a lay missioners in Latin America I learned Spanish in order to work with pastoral visitors. They gave up their native language altogether to participate in the church. How tragic that was to see the impact. Latin started because of the Roman Empire. The gospels were not written in Latin. The early church was not Latin. It is understood to be s "dead" language. I have left the church in my community where the Mass is in English but being said by those who are saying and doing everything to return to pre Vatican II. I have not left the church of the community of the Gospel, however. The Spirit lives in our lives. A good thing indeed. Perhaps words such as "precision, clarity, consistency" are more on the mark. And of course, it is not simply the consistancy and clear precision of Latin, it's what the Tridentine Mass communicated; the Mass' sacrificial and penitential nature, the bold truth of it's presentation of Holy Eucharist, it's beauty and reverence for the presence of Christ in that Eucharist, it's beautiful, traditional Catholic hymns and Gregorian chant, etc. It was the whole system that was lost. I love the Holy Church and my parish but I am one felt banner, one Protestant sounding awful hymn, one "alter girl" dressed up in boy's vestments, one irreverent reception of Our Lord in the hand like a potato chip, away from losing it. Oh? And worshipers who attend a Novus Ordo Mass can't and don't experience a connection with the past saints? This is an exclusive gift of the Tridentine liturgy? Well, go ahead and conduct a poll this Sunday and see what the results are. The church should jettison all use of Latin during the Mass. The same troglodytes who want Latin are the same hypocrites pushing "English only" everywhere else. The Mass should be celebrated in the language of the local diocese. If multiple languages are spoken, then there should be multiple Masses. But Latin? No way. I'd rather have Aramaic or Greek. You can have Greek or Aramaic in a Catholic Mass if your find the appropriate rite. I don't think anyone wants to force a "Latin Rite" Mass on you, but make it an option for those who like it. who still writes documents in that language ? Great insight young man for your commentary for it was by the Holy Spirit you have spoken the Truth. The key word in the author's argument for the Latin Mass was in the first paragraph - "spectacle." The Mass was never meant to be a spectacle. Go back to the Last Supper and the Mass of the first century - no spectacle. We know very little of the Eucharistic Liturgy of the first century. Many claimed at the time of Vatican II to have far more knowledge of what it was than was honest. there is sense of "spectacle" in their Liturgies. Spectacle? I've been to the Latin mass, I'm canonically a Ruthenian Catholic so I attend the Divine Liturgy of St. John Chrysostom weekly and I've yet to see any spectacle like the nonsense I've witnessed at many "new masses". For crying out loud, check out the dancing deacons and incense bearers in leotards at the LA Religious Ed Congress. Now, that is a spectacle. I have mixed feelings about this. I grew up with the Latin Mass, with my father (literal) being formerly a Jesuit. I took Latin in Middle School and High School. I have a deep connection personally and sentimentally to the Latin Mass. I also serve as a Catholic Chaplain in an interfaith setting in a hospital. However, my experience mirrors that of Pope Francis. Having attended Latin Mass across the US, the majority of people who attend do tend to be fairly rigid in their thinking. They are often influenced by SSPX theological interpretations, or oddly enough by EWTN dogma. They tend towards rigidly legalistic understanding and remind me more of neo-"evangelical" groupings and dogma. This is deeply sad for me as I love to celebrate the Mass in Latin, but have experienced exclusion for myself and my family in these "more traditional" settings. If one cannot be welcomed into communion and community where they are as they are, as Christ did, then there is certainly something off in that community. That has been my experience, in a number of places in the US (though typically not my experience outside of the US with Latin Mass). It does not speak towards everyone's experience. The key statement in the article is, "I did not at that point understand that the rituals of the Mass". The Mass cannot be understood as a collection of rituals. The feelings and experiences desired by the author are appropriate to many of the devotions of Catholicism or to personal contemplation. The desire to have such private prayer experiences facilitated by the liturgy is to completely misunderstand the purpose of communal prayer which is to build up the Christian for living in the secular world through the sharing of Scriptures and the Lord's Supper. The doubt that strictness and rigidity are motivating the young proponents of the Latin Mass does not ring true for me either. I think it is a self-centeredness, a desire to have a personal experience. Timothy and all present need to work at participating fully, actively, and consciously in building up the community. If your analysis is correct then one can only wonder how the Church ever thrived before the Post-Vatican II liturgies. How did anyone ever become a Saint if the Mass of Trent was so misleading and offending to their spirit of community. Not to mention why so many Catholics left off going to Mass after Vatican II. Why do you presume to know that no one can find God and Community via the Older Liturgy ? I find it interesting that he thinks no one should "dig" into why young Trads yearn for this this type of liturgy that reeks of an outdated model of ecclesiology, yet he does exactly that in his armchair psychologizing about why Pope Francis has the concern he does for those who cling to it and do become rigid. I have a feeling he hasn't read any biography about the pope to know how off base he is in his surmising. I also got the feeling that he thinks no one else, especially some one who loves the Vatican 2 reformed liturgy, has had the same kinds of profound feelings of connectedness to the saints. If he really wants to listen, he should be hearing of those experiences. When you say "outdated" what do you mean? I ask because a temporal metaphor seems inapplicable, or at least only awkwardly applicable, to things like theology and liturgy. Too many traditional people proclaim that the Latin Mass is the ONLY valid Mass and that anyone outside of that aren't true Catholics. There are also Catholics who believe Vatican II is invalid. All of it. Period. When I joined the Church over 20 years ago, I had no idea of this liturgical war. I found out about it when fellow Catholics thought Pope Benedict was going to give them their old ways back. Then he didn't. They were devastated and angry. I actually heard older Catholics say they were focusing on teaching the old ways to their grandchildren because they had given up on their kids' (raised Vatican II). This attitude is the problem, not which way we do Mass. The saints that I encounter at Sunday liturgy are those that I celebrate with (in English) and work with in the ministries that are prominent in the everyday life of our parish. I am one of those old-timers that lived through the changes of Vatican II and although the pre-conciliar liturgy helped to form my spiritual life, I have come to appreciate and believe that the Holy Spirit was the guiding force in that blessed event. Returning to the practices of the Tridentine liturgy just seem to be counter to what the Holy Spirit intended. Besides, I'm just not sure how to really CELEBRATE in Latin. I agree that the Eucharist should form people for ministry, people who bring the face of Christ to the world, like many see in Pope Francis. Most people are more likely to be encouraged to be bold in living their faith through the sharing that should go on in a Mass in the vernacular, than by making contact with the saints of their personal devotion. Where people who participate in the Eucharist live visibly more Christlike lives, the young can only be attracted to be a part of such a community. The popularity of Pope Francis becomes the popularity of the Church. What is most missed in structure of the mass in this post-Conciliar period is "The Last Gospel", this should be re-instated. The first words of the Gospel of John pull together Christ, the man and God with His prefigurement in the earliest parts of Genesis. "In principiat erat verbum (logos)..." Will the young Catholic folks today understand the connection between "logos" and "pneuma", thus: "And the Lord God formed man of the dust of the ground, and breathed into his nostrils the breath of life; and man became a living soul." As a boy growing up in the 50s and 60s I loved the Mass. Perhaps especially because as an altar boy I was so close to the priest and memorized all of the Latin responses. My memories are warm and cherished. I have, however, no desire at all to go back to those ad altare days. Why? They emphasized form and formula... not the depth of human life. Because they so intentionally excluded women and girls. Because in hushed tones the congregation (better said audience?) could scarcely hear and had to follow as best it could with a prayer book. And Latin... though I loved Latin then and now (I still read the Latin classics), I knew that even if people could hear, only a small number would understand. It might as well have been spoken in Sanskrit ... another language that Jesus did not speak. With Vatican II came not congregation but community. It brought inclusion and not intentional exclusion... and that inclusivity has generally grown (with some notable years prior to Pope Francis excepted). It allowed us to pray in our languages. When I now say Lord I am not worthy, it resonates in a way that even my capable translation of Domine non sum dignus does not allow. Better yet, my five year old granddaughter might have a sense of what the English means. So, is Francis' description of rigidity a function of his life? In some regards it may be... but we sell him far, far short if we believe that his is an unintentionally myopic view occasioned by bad experiences. No, I think his view is kind, scholarly, thoughtful and pastoral... I might even go so far as to say inspired. Timothy, you sound like a wonderful, smart, sincere, spiritual and committed young man and I wish you a faith-filled life, I even hope that you will grow in faith by attendance at Latin masses when you find them ... but please, please, please leave me an evolving church full of grace, warmth and welcome. I'll leave the Latin mass to the enjoyment of the 16th Century and the Council of Trent though I shall not forget that ours can be a big tent.. But, for the rest of us I might wish continued growth in our liturgical practices and might recall this sage bit of advice: Ore stabit fortis arare placet orestat. "O rest a bit for 'tis a rare place to rest at"...inscription on a bench at Oxford. I suppose one should give it a rest after one's leg is pulled. Very good Alfred! And all in sincere good humor. Still, what does it tell us about communicating in a language that many/most don't understand? While I understand what this author is saying about why he prefers the Tridentine mass, I don't understand the attitude of many of the traditionalists. If they are so into the Tridentine mass, wouldn't they also be into submitting to the authority of the Church, councils, bishops & pope, a more basic and traditional concept than mass in Latin? Yet the rebellious attitude of many betrays their traditionalism (not saying that applies to this author). And while some rail against the "Protestant" Novus Ordo, aren't they acting like many American Christians in picking and choosing what they like and don't like about Catholicism and trying to satisfy their feelings in seeking transcendence through the mass rather than simply seeking God (which doesn't always lead to good feelings but sometime to dryness or a dark night)? And to hear some of them judge others for the clothing they wear to mass or how they "casually" take the host is unloving and unChristlike. I think they forget, Latin was once the vernacular and the Tridentine mass was once new. Many would not be in the church were it not for Vatican II. Having come into the Church from a Protestant and Anabaptist background ten years ago, the attitudes of many traditionalists look very contradictory and familiar to me. While on earth, Jesus did not offer transcendence through forms, he offered and continues to offer it through a relationship with a God who is both immanent and transcendent. find that it moves their soul ? As long as the "New Mass" is offered for all who wish to attend, what harm is there if a Priest says the "Old Mass" who would like the be present ? with those young people who like to worship as those Masses ? As I have grown up under post-Vatican 2 era, I don’t remember anything about the Latin Mass. My only experience with something Latin is once in a while, our Church sang a Latin song during the solemn veneration of the Body of Christ, “Tantum ergo Sacramentum”. How can I describe my reaction when I listen to this song – confuse, and lost! I kept on asking the question – what is the meaning of this? Singing in a dead language is MEANINGLESS to me and to most people of this age. “…Let the dead bury the dead…”. I suspect that some people are drawn to the Latin Mass because it allows them to imagine all kinds of heavenly things when they listen to something that is mostly incomprehensible to them. Have you ever heard the Buddhist monks chant in Sanskrit in the temple? Nobody understands but the chant allows them to have the sense of transcending the mundane reality and to ascend to some divine realm… For me, by focusing on EVERY word of the vernacular Mass, either in English or in my native language, it allows me to deeply understand and participate in the divine and mystical aspect of the Mass. Go and find a translation of the Latin Hymns you do not know and that are occasionally sung at your Church. To me, the crucial part of Timothy's piece is this: "I was soon overwhelmed by a feeling that I can best describe as communion. This was, I mused, the Mass as it was experienced by so many saints throughout history. Although there was no one in the pews around me, I began to feel as though I was surrounded by the saints who had come to know and worship God through this liturgy." And of that part, these words particularly struck me: "Although there was no one in the pews around me . . . ." Perhaps there was no one in the pews around him because the foreign words of the Latin Mass hadn't drawn others as they had him. And it seems a great shame to me that he felt communion with the "saints throughout history" but not with people of his own place and time. with a classical studies group as a college Latin major. Our visit included an audience with Pope Paul VI at Castelgandolfo. The audience began with the Pope's addressing every recognized group of visitors in that huge room in their native language. That took the better part of an hour. And then the group burst into prayer and song in Latin, which had only recently been replaced by the vernacular at Vatican II. I realized that I understood the Latin more fully than did many of the Catholics in the room, but for that time all the Catholics present (plus a few like me, who knew Latin outside the Church context) was joined together by that ancient language. So there I stood, tears streaming down my face at the beauty of that communion, to use Timothy's word. Now that experience comes back to me often, especially at the Easter Vigil, where I, now an RCIA teacher, celebrate my eventual conversion twenty years ago (wearing the same lace mantilla that Paul VI blessed that day in Italy ). I think it's good that people have a chance to attend the Tridentine Mass if that makes them happy. But I think Pope Francis was totally right to say that the liturgy of the Church will remain in the vernacular. And I believe that those who choose the old form over the new are missing their best opportunity for communion with people of their own time--those whom God wants us to welcome and embrace, including those who may not take it as seriously as they do. My parish uses the old Mass settings for one service each month, at which our most elite choir leads us in the beautiful responses and sings songs in Latin before Mass and for the offertory. This allows those of us who entered the Church after Vatican II to learn the beautiful words and melodies of Masses past--and those who were already Catholics before Vatican II to reminisce--without losing the communion we can experience by participating most of the time in a liturgy in our own language. This is another example of the "both/and" approach of Catholicism that I came to appreciate so deeply when I was in RCIA myself. "...it seems a great shame to me that he felt communion with the "saints throughout history" but not with people of his own place and time." Why, though? I mean, I think his wording is less than optimal, since the saints in heaven aren't really "past" saints. But our own time and place is just a minuscule part of the whole tapestry of reality. My "time" will have changed by the time I'm done typing this, and my place changes constantly. A particular time is already gone by the time you notice it, and becomes part of the past. Is Vatican II's decision to have Mass said in the vernacular any different than what occurred during Peter's address to the people in Jerusalem on that first Pentecost? It seems to me the Holy Spirit was simply doing His thing at V-II. If you hear the message better in Latin, so be it. But recognize (i.e., be less rigid) that others hear it better in a language more familiar to them. I am perplexed with the statement of feeling as though surrounded by the saints through this liturgy. Is not the Communion of Saints a grace we share regardless of the vernacular? What of the many saints who did not know or worship in Latin? Are they excluded. I must agree with Pope Francis statement about this rigidity. I witness a tragic divisive mentality as a fruit of many traditional Catholics exclusive emphasis that seems very contrary to the very meaning of Catholic. I don't know if the Law and Order Catholic has gone away or not. I still here stories about Bishop/Priests/Rectors driving out those who disagree with them. I think Francis is much more of an authoritarian Pope than Paul, John Paul or Benedict. Having just returned from our annual Catholic Medical Association meeting in Denver our daily Masses celebrated by Bishops in English was a joy & beauty to behold as well as to participate in. From the tone of some of responses to this article, somewhat derogatory, it is time we all unite together under Pope Francis & realize that the essence of the Mass is not in what language it is proclaimed in but it is in the Eucharist which is its true Reality. Let us put aside our petty disputes, love & support one another, for the real enemy is Satan who seeks to divide us . I was quite put-off in my youth with the change of the Liturgy to the Venacular! I had spent my entire Catholic Education K-12 memorizing the Latin Mass and the hymns. In truth, I never really understood what was going on because the priest had his back to me! Last year, I attended a Latin Mass and I was stunned by how much I disliked it. I felt disconnected. I felt like an outsider in my own church and once again, the priest had his back to me. I want to connect with the clergy in my parish. I want to understand what is being said. And, there were no children present for the Latin mass which I really disliked. Bravo for the traditionalists who would like to see the Latin Mass return; but, in my opinion, it should not see the light of day if it means that the Venacular Mass will be discarded. Why not have the various deaneries come up with a schedule wherein each church agrees to host a Latin Mass once a week? Let us begin by recognizing what the Mass is: It is the Last Supper. Jesus gathered His friends, His “family”, around a table much as we would our own families around the table at Thanksgiving, although celebrating the Jewish seder meal. These men had been with Him for three years, listening to Him, talking to Him, in a Galilean dialect of Aramaic, the vernacular for them. They surrounded Him as he spoke the words of Institution. They saw not His back, but His face as he offered them His Body and His Blood. They wore street clothes. They did not kneel at a communion rail to receive the Sacrament. He handed the bread and the chalice around to them one at a time. What they witnessed was nothing they had ever experienced before, not even realizing the impact this occasion would have on the history of the world. Most of the entire New Testament was originally written in either Aramaic or Hebrew, with the exception of Paul’s letters in Greek and and in Latin, depending on who his audience was. He was fluent in both languages. Since then every reiteration of the New Testament has been a “translation.” Latin became the language of the early Church because they lived in the Roman Empire, whose language (vernacular) was Latin. I grew up on the Tridentine Mass and was in seminary when Vatican ll occurred. My experience as an altar boy taught me the Latin responses to the priest’s prayers. The people in the pews heard the Latin, read the “translations” in their prayer books, and assumed that whoever had done the translation knew what he was doing. But no matter where in the world one attended Mass, what you read and what you could understand was a translation. To assume that Latin is the only verifiable translation for the Roman Catholic Church is not accurate. It may bring back some fond memories (or what we think are memories, like white picket fences) for many my age and older, but that does not make that Latin Mass more true. We have indeed lost membership in our churches since Vatican ll, but so have most other denominations. This loss has more to do with culture than with translations. But to paint that reality on having the priest saying Christ’s words as He said them on Maundy Thursday, facing his “family” from the dining table with his family facing back at him, in a familiar language, says more to me about the reality of transubstantiation than does looking at his back and hearing it in a foreign language (which I studied). The Mass is first and foremost the Eucharist. What language is used, what hymns are sung, whether or not Gregorian Chant is heard and what rituals are employed, neither add to nor subtract from that reality. If the Tridentine mass is your cup of tea, I say go for it. I suspect that in the not too distant future, as those my age and older die off, the younger people of God who are discovering the Latin rite will move on to the next shiny object along their faith journey. Latin will continue to be the language in which official church documents are written, but the resulting study of those documents will be in translations. The validity of one’s faith does not hinge (or shouldn’t) on the language used by the priest to recreate Christ’s act. Rich, your response is perfect. Mass is not about the words or how we feel; it's about receiving the Body of Christ as food for our continuing journey toward union with him. The Mass is also the crucifixion. The last supper, and the passion and death of the Lord were all one unified liturgical act. And much of that was probably conducted in Latin, as his Roman executioners would have come from the Latin-speaking lower classes. They helped to offer the first mass, and almost certainly did it in Latin. At the last supper, though, Christ and his ministers--the apostles--all faced the same side of the table. This is recreated in both ad orientem worship and ad populum, with priest and ministers typically on the same side of the altar in either case. 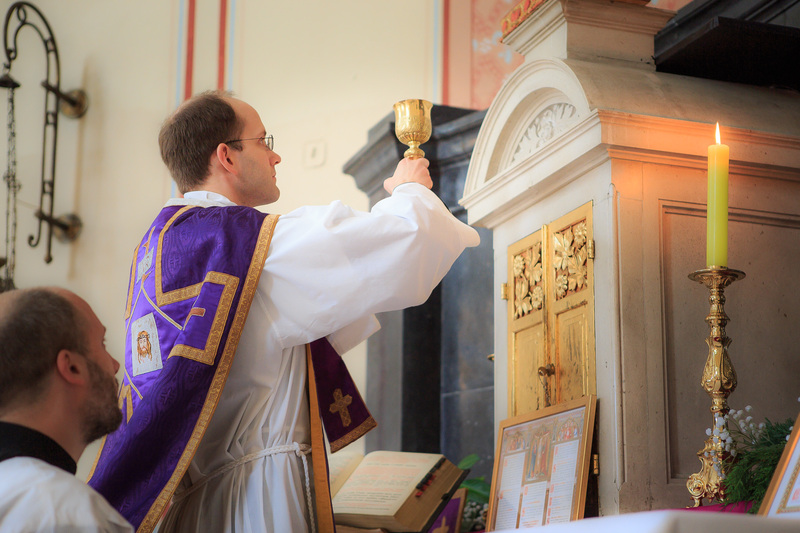 Generally speaking, ad orientem does seem to make more sense to me, though. The priest, after all, only rarely addresses the congregation, regardless of which form of the mass he is celebrating. Still, ad populum wasn't unheard of even in the Tridentine mass. In my case, though, it makes it more difficult to focus on the mass, since the priest seems to be drawing so much attention to himself as an individual. Ad populum is more flashy, more of a spectacle, but I understand that some people are better than I am at sublimating that into a sense of worship--and that's fine. More power to them. “a caution that stems from experience”? Please. Like no one is phony and deluded about interpreting their perceptions of “experience,” especially what they assume to be the experience of others. The Catholic exodus obviously has more to do with the pervasive disdain for humility and respect for the peoples of the past inherent in progressivism. The essence of progressivism involves a refusal to even consider that truth is a reflection of the mind of God and therefore immutable and unchangeable. You note some very good things about the traditional liturgy, but then go on to implicitly accept the liberal characterization of the humility experienced by honoring the communion of saints as being the mere following of “rules.,” which really reflects an implied acceptance of the adolescent arrogance of progressivists obsessing over endless ways to prove their superiority to the peoples of the past while remaining oblivious to the sins of pride necessary to do so. We don't get clown liturgies or self-worshiping "centering prayer" from people pursuing humility. I was a Monastery lately, none of the good Sisters where their habits anymore. I stopped in at the library in the Retreat Center and every book was from 1965 or later. As if nothing ever written before then had anything important to say. Mao had his "Cultural Revolution"
and some Vatican II Idolators make Vatican II their Cultural Revolution. If anyone asks me about the vitality and youth of Muslim communities in Western countries I'd answer without hesitation: the placing of 14 centuries of tradition over the fads of the moment. Most Muslims embrace sacrifice for the sake of Allah. Most of them don't bend. I suspect that many young people are more likely to follow or be enticed by a strict moral code than by the whims of the moment. At the same time, it'd be uncharitable to write off Pope Francis's comments. I think he is up to something. I loved his comment that love is not rigid and love will be crucial when we are being judged one day by Christ the King of the Universe. I suspect Pope Francis is appealing to our motives. If I attend a Tridentine mass because of a better than thou attitude then that's a problem. I'd be feeding my pride. Anyways, tradition has the backbone the post modern world lacks. So I personally would choose tradition over fashionable at any given moment. Those who love the Latin Mass usually have a nostalgia for the pre-Vatican II times - with misogyny openly practiced and considered acceptable, a time before contraception had been invented, and racism was as acceptable as misogyny. The Latin Mass carries those connotations for me, so I have no desire to see it revived. Have you done a scientific study of those who like the Mass in Latin ? You don't think Misogyny is still openly practiced - have you failed to notice who the president is ? world necessarily a better place - the "Hook-Up" culture ? You have those connotations, and everyone should bow to your feelings ? Whether by "Latin Mass" you mean the Extraordinary Form or the Ordinary Form offered in Latin (a licit option, and perhaps the preferred option per Vatican II teachings) this cannot be so, as most are too young to have lived pre-Vatican II and therefore by definition cannot be nostalgic for it. I invite and encourage you to assist at a Latin Mass in either form one Sunday, to meet the crowd you disparage. Please, sir, pray about going to confession and returning to the Church. Our Lord's children--us included--may leave the house a mess, and procrastinate like temperamental teenagers when Jesus asks up repeatedly to clean up. But no matter how embarrassing the state of the house, it is still *his* house, and when time finally claims us, our only hope is that it should claim us in it. We're confusing 2 separate things here. 1. The language of the liturgy. There's a lot to be said for a hieratic language, but it's also true that there's long been an appetite for the vernacular. Vatican Two (which is not without flaws) called for allowing the limited (not complete) use of the vernacular in the Mass. Fair enough. 2. Language aside, Paul VI had absolutely no authority to change the text of the Mass. Got that? Popes can't just do what they want. Unfortunately, since Vatican One they think they can. And Paul VI thought he had the right to change the Mass. He didn't. Again, this has nothing to do with the language of the liturgy, but its text. I am confused in reading the comments: are some contrasting Latin Masses with Masses offered in the vernacular when they mean to contrast the old Mass (Extraordinary Form) and the new (Ordinary Form), or do they really mean to contrast Latin Masses (regardless of the missal used) with Masses in the vernacular (again regardless of form)? Timothy Kirchoff is a graduate of the University of Notre Dame. He lives in Chicago.